When we asked professors to pick an item in (or on) their desks and tell us about its significance, we didn’t have the faintest idea what we would get. They provided two-minute office tours, pointing to Shakespeare dolls perched on shelves, framed calligraphy hanging on the wall, and cheese-shaped stress balls ready for a squeeze. The following six objects made the cut and, ultimately, we met our objective of not only learning about the things, but also their owners. Read on for tales of espionage, a water buffalo called Sue, the Russian Olympic mascot, and more. Before pre-gummed envelopes entered the mailstream, letter writers used other methods to keep their words from prying eyes. This wax seal — called the “Sheaf of Snakes” — is a replica of one John Donne used to secure his letters in the 17th century. 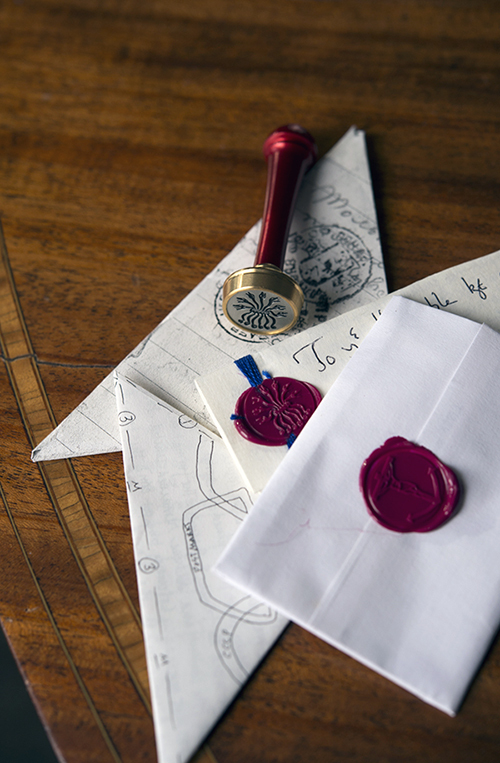 During the poet’s era, wax seals were a common way to close letters, and each person had his or her own. “It was a way of identifying yourself,” explains Margaret Maurer, the William Henry Crawshaw Professor of literature. Seals were also a tool used in “letterlocking,” an intricate process of folds and cuts that turned the paper into its own envelope. Combined with a wax seal, the letter would be noticeably tampered with if anyone opened it before the intended recipient. Donne and his letters are of intense interest to Maurer as she collaborates on an edition of his correspondence for Oxford University Press. Whether the poet did or did not letterlock, he certainly had reason to. First and foremost, he was born into a Roman Catholic family during a time when the English Church no longer recognized the authority of the pope of Rome. Then, in his early adulthood, he was employed in the household of Queen Elizabeth’s Lord Chancellor, Sir Thomas Egerton. The queen’s surveillance network, anxious to uncover any sign of a plot against her, kept a close eye on the household happenings — possibly including letters to and from Donne. There is ample evidence, Maurer notes, that Donne used both a cipher and invisible ink to protect his correspondence. “We know there was active espionage,” she says. In the edition they’re working on, Maurer and her colleagues are not primarily concerned with secrecy tactics. They have trickier puzzles to solve. Of the approximately 240 letters by Donne that survive, only some 37 are in his handwriting. The others have been copied by various people and are plagued with numerous question marks, including dates that were intentionally omitted, illegible words, and obvious errors. So, the task for Maurer and her colleagues is a slog; they’ve set a 10-year deadline for themselves. Archivist Sarah Keen is always looking for rainbows — at least when it comes to film. These circular polarizing filters help her determine whether film is polyester (good) or acetate (bad). “They’re a geeky archives technical item,” blushes Keen, who is associate professor in the university libraries and head of special collections and university archives. But if the filters have no effect and the film either looks black or simply translucent, the film is acetate — “and you know you have a preservation issue,” she says. 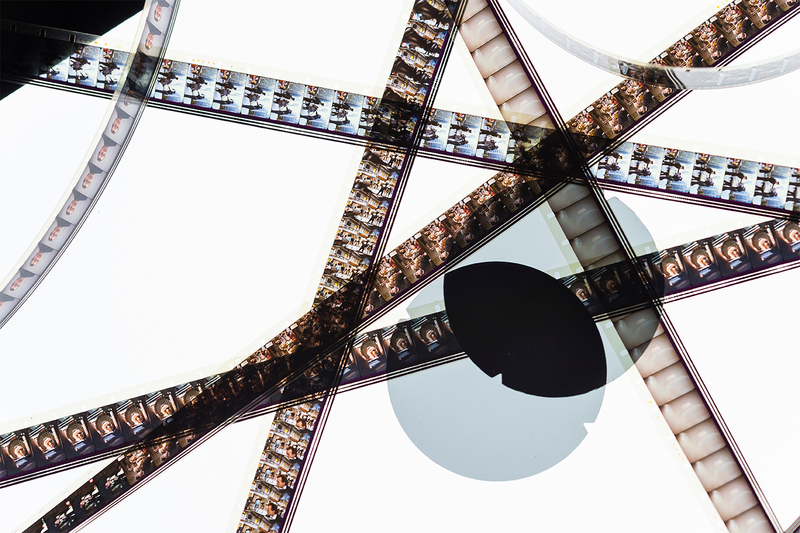 Acetate film will degrade through a type of decay called “vinegar syndrome,” so the archivists will need to reformat it sooner than later — and that inconvenience can make a typically sweet archivist quickly turn sour. 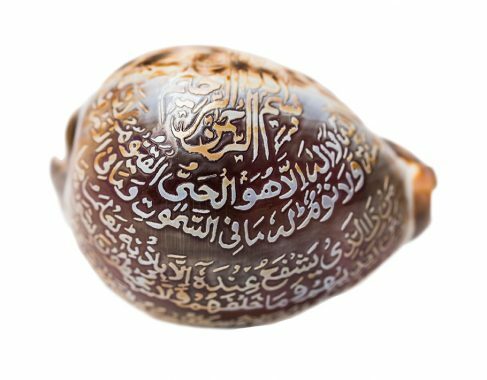 This palm-sized shell bears a message greater than the ocean from which it came. “A typical Muslim will use it at least ten or fifteen times a day: when we start eating, begin a project, during prayer … for almost anything,” explains Noor Khan, associate professor in history and Middle Eastern studies. In the early ’90s, as a college student at the University of Chicago, Khan was visiting family in Karachi, Pakistan. Her cousin bought the shell as a souvenir for her at nearby Clifton Beach. “It encompasses a lot of my personal and academic identity because it’s from the South Asian subcontinent and it’s in Arabic, which are my two fields,” says Khan, who co-founded Colgate’s Middle Eastern and Islamic studies minor (now a major). Although she was born and raised in Minnesota, Khan often visited relatives in Pakistan and India growing up. “I have family on both sides of the India-Pakistan border, so every time there are tensions, I literally have family in both armies,” she says. As a teenager in the 1980s, she also spent three years living in Madina, Saudia Arabia, the second holiest city in Islam where no non-Muslims are allowed. Khan is currently working on a memoir about her intriguing life, which has included a surprising number of wild animal encounters. 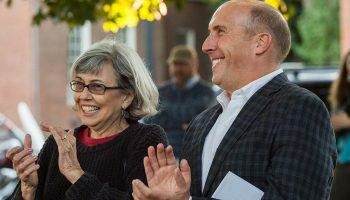 One of them is her favorite tidbit of personal trivia: Khan received a water buffalo — that she called Sue — as part of her bride gift when she married Nady Abdal-Ghaffar, Colgate’s senior lecturer in Arabic. 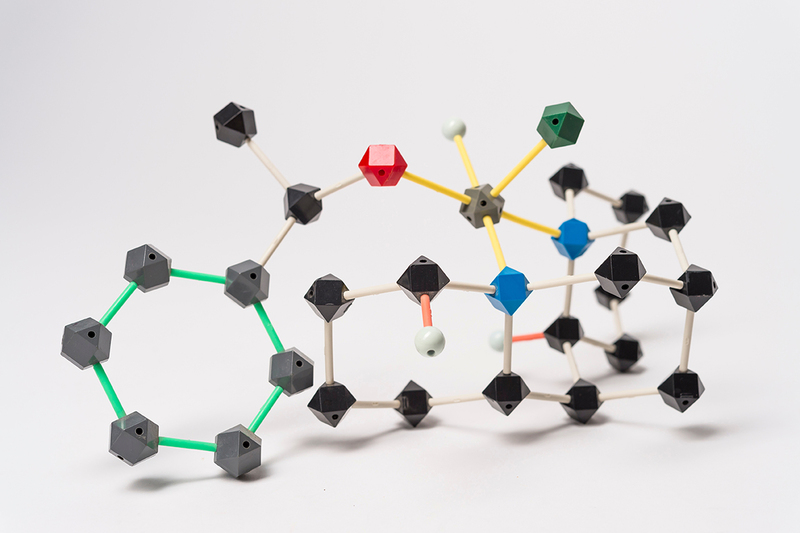 You could say this molecular model was the catalyst for Professor Jason Keith’s career — both literally and figuratively. “This was the molecule that started it,” says the chemistry professor. The model has accompanied Keith from graduate school at California Institute of Technology, to his post-doc at Texas A&M, to his fellowship at Las Alamos National Labs, and finally, its current stop at Colgate. “It’s my chemical totem,” says Keith, who traveled cross-country to Colgate in 2013. A computational chemist, Keith doesn’t work with test tubes and beakers. His lab is his computer, where he uses mathematical equations, quantum physics, and computer science to look at chemical reactions. He built the model from a kit in graduate school as he was co-authoring his first published paper, “A Computational Model Relating Structure and Reactivity in Enantioselective Oxidations of Secondary Alcohols by (−)-Sparteine−PdII Complexes.” The model shows (−)-Sparteine−PdII; Keith and his office mate were using it to help them visualize their theory. Keith and his coauthors were testing why certain types of chemicals were or were not reacting. “Selectivity is where everything is at in synthetic chemistry,” he says. “If you can do a reaction that oxidizes one type of chemical environment but doesn’t oxidize some other ones, it can help you build specific molecular targets.” The real-world implications of this work could apply to myriad natural and manmade products, from fuels to pharmaceuticals. In this particular system, they modeled the selectivity of two molecules called enantiomers, which have the same structure but are mirror images of each other — “like your left and right hands,” Keith says. One reacted and the other one didn’t. “This is like your right hand fitting into your right glove while your left hand doesn’t fit,” he explains. Visualizing chemical reactions can be a hurdle for students, so in his Inorganic Chemistry class, Keith teaches undergrads to build models and think about three-dimensional structures. With years of experience, Keith himself can grasp the spatial components by turning them over in his head. “Being able to see a two-dimensional stick drawing and imagine what that looks like in three dimensions, and then being able to rotate that three-dimensional object in your mind so you can understand how that three-dimensional object reacts with other three-dimensional objects — that’s the type of chemistry I do,” he says. The research of math professor Silvia Jiménez Bolaños is quite complex, but to tackle it, she only needs three simple tools: a pencil, paper, and her favorite shoes. Her left loafer spells out the Fibonacci sequence, in which each number is determined by adding the preceding two numbers. 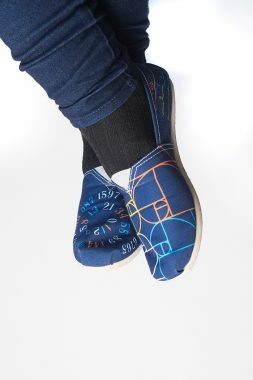 The right shoe depicts a Fibonacci spiral and representations of the golden ratio, aka the golden number (1.61803398875 or phi). When you take any number in the Fibonacci sequence and divide it by the number before it, the answer approximates the golden number (it becomes increasingly exact as the numbers get bigger). To draw the Fibonacci spiral, you start with rectangles representing increasing Fibonacci dimensions that are placed adjacent to each other. The spiral can be drawn from the beginning (smallest) rectangle to each increasingly larger rectangle. “That type of spiral is an approximation of the golden spiral, which grows by a factor of the golden ratio phi for every quarter turn it makes,” Jiménez Bolaños says. Beyond a fascinating math pattern, the Fibonacci sequence and the golden ratio often appear in nature (pinecones), architecture (the Parthenon), and art (the Mona Lisa) — something you can bring up at your next cocktail party. Jiménez Bolaños provides other examples, too: the shape of the galaxies, an 8.5 by 11-inch piece of paper, and the symmetry of faces that are considered most attractive. A major part of the math professor’s research is using partial differential equations to study mathematical materials science, which has implications for fields ranging from biology to electronics. Some materials scientists have worked on microstructures that have Fibonacci patterns. 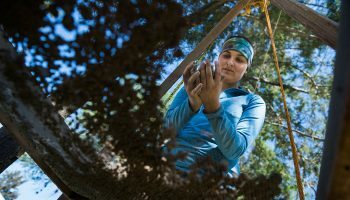 Although the shoes aren’t directly related to her research, Jiménez Bolaños says they give her comfort — which is one easy problem to solve. Walking through Moscow in 2005, Professor Adrian Giurgea happened upon a plastic toy that coaxed a memory from his youth. It was Giurgea’s first time in Russia, but he had a distinct recollection of the little bear named Mishka, whom he’d met many years prior. The teenage Giurgea could see the resemblance. “I liked it a lot and I was always begging for it, but he wouldn’t give it to me,” he recalls. 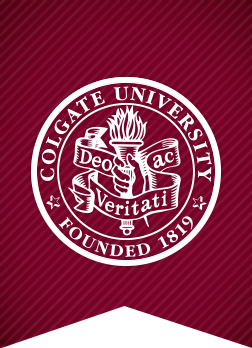 Years later, the adult Giurgea — who had become Colgate’s director of the University Theater — traveled to Russia for the first of what would become many trips. 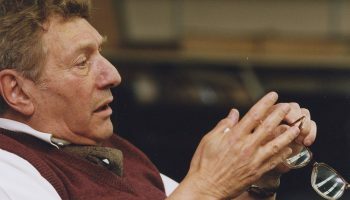 He’d been yearning to immerse himself in its theater scene because “it’s a country that loves and respects theater,” Giurgea says. The opportunity presented itself when he was hired to perform in a production of Chekhov’s/Shakespeare’s Three Sisters/King Lear. Meanwhile, the little bear had never left Giurgea’s memory. He immediately recognized him when they were reunited through an old woman peddling tchotchkes on the street. As it turns out, Mishka isn’t a rarity. 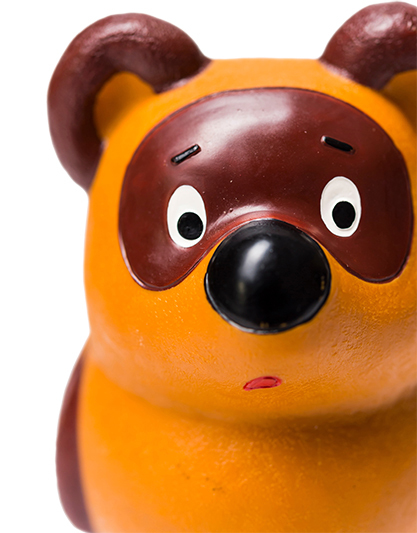 The bear pops up throughout Russia as he clings to his mascot fame from the 1980 Olympics.